Once a prison-guard forever a prison-guard. We protest a master plan, they seek to legitimize Menelik. We protest against injustice, they talk about Oromo secession. We protest killing, they talk about the status of Addis Ababa. We talk about solidarity, they talk about unity. We talk about a freedom Charter, they talk about an Oromo government they have concocted in their head while dreaming a bad dream. We talk about preparing for consensus, they talk about an impending conflict and wage war on Oromos everywhere. We talk about people, they talk about territory. We talk about land as livelihood, they talk about flags. We talk about rights, they talk about power and privilege. We talk about language, they talk about 'national identity' in a multinational country. We talk about the rights of all oppressed peoples to collective emancipation, they foment their Oromophobia saying that the only problem of Ethiopia is the Oromo. We talk about justice, they talk about security. We talk about equality in dignity, they talk about preservation of the old prison-house. Why do they want to distort the demands of the Oromoprotests? Why do they assign a slogan that the protests haven't picked? 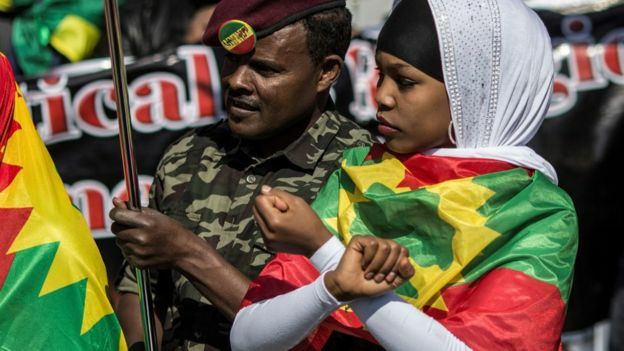 Why do they seek to obfuscate the simple and straightforward demands of the Oromo? Because they want to delegitimize the movement and discount the Oromo efforts to bring about change. They want to draw a caricature, a scare crow really, to deny support to the revolution and to kill it. At a deeper cultural level, they, like the TPLF, read from a script that reframes peoples' questions, misreads the symptoms, and offers a wrong answer/prescription that suits only their own wishes. True to character, they hate and fear the people. They strive to silence the people. They stifle all efforts at popular self-expression. TPLF-EPRDF fears election. Their counterparts in the opposition fear the very idea, the very mention of or allusion to popular referendum. They insist on keeping the prison safe at any cost. In short, the only politics they know is the politics of a prison-guard. Born and bred in imperial times and trained as prison-guards of the dead and the living, they keep protecting a dead coffin of an emperor long dead, a script that is long gone obsolete, and a prison that still kills thousands (Qilinxoo), a prison that is a metaphor for the country itself. One wonders if the privilege of a prison-guard is so much worth defending.